The International League of Peoples’ Struggle stands in solidarity with Rosalba Romano and the editorial board of Vigilanza Democratica in their fight against abuses and impunity of Italian law enforcement agencies, and in their unrelenting campaign of defending civil liberties of the Italian people. Comrade Rosalba is a member of the Partito dei CARC and chief editor of the Vigilanza Democratica website. Together with colleagues in the editorial team, they stand accused of ´defaming´ police agents of the VII Reparto Mobile of Bologna. Since 2013, Vigilanza Democratica has courageously reported on the abuses committed by the Bologna police unit. It has consistently exhorted readers to uphold the Italian Constitution, fight for truth and justice, fight against repression, and police abuses and impunity. It has called for police agents to be clearly identifiable when they are in service and for including the crime of torture in the Italian penal code. Vigilanza Democratica has also militantly called for the dissolution of the VII Reparto Mobile police unit of Bologna. Comrade Rosalba and colleagues are now facing retaliation for upholding civil liberties and fighting against state abuses and impunity. The ILPS condemns the repression of free speech and the freedom of expression. We stand firmly behind the comrades of Vigilanza Democratica and the Partito dei CARC in their just struggle against the abuses and impunity of law enforcement agencies. 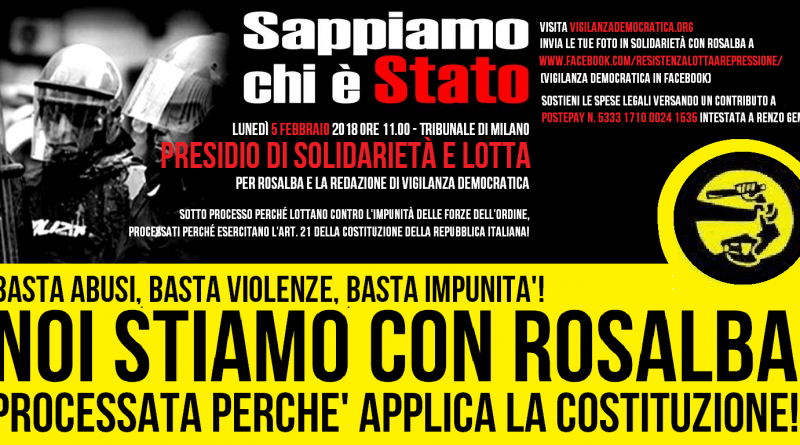 We call on ILPS member organizations and friends in Italy to join in declaring: Solidarieta alla Compagna Rosalba e alla redazione di Vigilanza Democratica! Basta abusi e impunita!